This is the first game in the Sonic the Hedgehog series. For other games in the series see the Sonic the Hedgehog category. 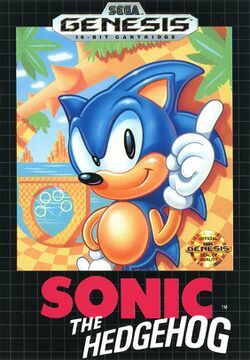 For the Sega Master System and Sega Game Gear game, see Sonic the Hedgehog (8-bit). For the Xbox 360 and PlayStation 3 game, see Sonic the Hedgehog (2006). Sonic the Hedgehog's title screen. 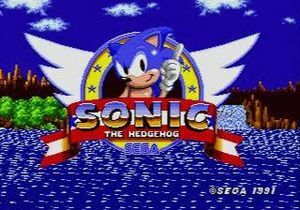 Sonic the Hedgehog is the platform game that launched the career of Sonic the Hedgehog and Sonic Team. It was the first in Sega's Sonic the Hedgehog series. Sonic was intended to Sega's mascot to compete with Nintendo's Mario. The game and character were specifically designed to demonstrate the processing speed of the Sega Genesis. This was the first game to propel the Genesis into mass popularity in North America. After it was released, it eventually replaced Altered Beast as the bundled game with the console. The game featured many novel elements which contributed to its popularity and helped to promote the uptake of 16-bit consoles. Sonic the Hedgehog added the element of speed to the standard platform formula and introduced other unique elements as well, such as the loops, springboards, hi-speed devices, and rings now permanently associated with the game series. Since its release it has been ported to many other systems and compilations, including Sonic Jam, Sega Smash Pack: Volume 1, Sonic Mega Collection (and Sonic Mega Collection Plus) and, most recently, the Sega Genesis Collection. It is also available via the GameTap and Wii Virtual Console download services. A special Game Boy Advance version called Sonic the Hedgehog Genesis was released to celebrate the series' 15-year anniversary. This version included an "Anniversary Mode" where the only change was the addition of the spindash move introduced in later games. There is no background story, but the goal of the game is to rescue animals and the world from the mechanized army that Dr. Robotnik has unleashed. This page was last edited on 30 May 2016, at 13:59. This page has been accessed 56,283 times.